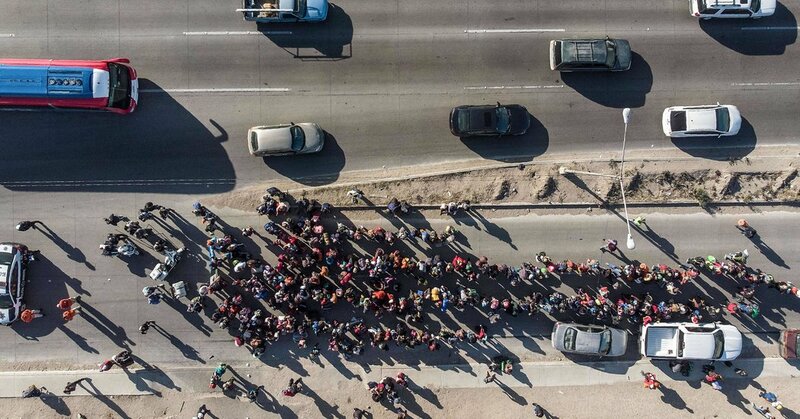 TIJUANA, Mexico – The Vanguard of what President Trump has labeled an invasion force formed an orderly line at about 6:45 a.m. on Thursday near a major border crossing between Tijuana and the United States and waited patiently. A steady flow of pedestrians and cars traversed the official border crossings, in an apparently smooth and normal process. Contractors worked on the steel border fence that reached across the beach and into the Pacific Ocean, unfurling concertina wire along the top of the barrier and across the sand while the American military police looked on. The migrants on line had been the first members of the caravan, which started in Central America for more than a month ago, to make it to Mexico’s northern border. They arrived on Sunday, and by trying to set up their asylum interviews were now moving yet another step closer to their goal of reaching American soil. Joe Rivano Barros, a field officer for Raices, a Texas-based advocacy group that has been helping the entourage, scoffed at the notion that this group was a threat to the United States. They are poor, and harmless, he said, “and they are excited to be part of the United States.”  Migrants from the caravan have been arriving in Tijuana since Sunday in spurts – scores here, hundreds there – entering the city mostly on donated buses. Some 800 had made it by Wednesday night and another 900 or so on Thursday, with the rest expected over the next few days. The caravan’s coordinators and government officials said they expected a total of about 5,000 migrants to gather in Tijuana and nearby municipalities in the next few days, while some municipal and state authorities have offered ore conservative estimate of about 3,000 to 4,000. Officials from the state of Baja California said Thursday that some 9,000 migrants were currently moving through Mexico in caravans, although not all were expected to wind up in the state. For weeks leading up to the midterm elections, Mr. Trump and his administration issued frenetic warnings about the caravan’s threats to national security and the American economy. The president, calling the caravan “an invasion,” deployed thousands of troops to reinforce border security, and border agents were reassigned to buttress staffing at major entry points. “My plan is to cross to the other side,” said José Amaya, 36, a Honduran migrant, adding that he had not ruled out any option, legal or illegal. Although the caravan has not posed any apparent danger to the United States, it is already threatening a potential crisis for Tijuana and the surrounding state of Baja California. Local and state officials have been scrambling to figure out how to shelter and care for the thousands of migrants. Net voordat de caravan’s aankomst was, was de regio onder druk omdat een backlog in asielzoekers gedwongen was te wachten zo veel als vijf of zes weken voor een afspraak om hun case op de Amerikaanse grens te maken. Veel hebben zich opgesloten in migrant shelters in the meantime. With the caravan’s arrival this week, the region’s network of shelters is now close to or at capacity, officials said, and supplemental emergency shelters have been forced to open in churches and other places. On Wednesday night, the authorities opened a temporary shelter in a sports complex in the city, but it has capacity for less than 400 migrants because, officials said there were insufficient money to cover the cost of housing more. State officials said the governor had appealed to the federal government for financial assistance to prevent a possible humanitarian crisis. But some migrants from the caravan have avoided the shelters, saying they feared being caught behind locked doors at night and detained by the migration authorities. Instead, they have been sleeping outdoors – in parks and on the beach. Many migrants who have already arrived have been biding their time and figuring out their next move: try to cross for illegal immigration remain in Mexico and possibly seek legal status here. For those who intend to apply for asylum – likely a minority of the total caravan – coordinators and advocates hope to organize legal workshops to review their cases and help them prepare for their interviews with American border officials. Last jump, advocates provided similar help to a large caravan or mostly Central American migrants that traversed Mexico and ended up in Tijuana. At its peak, that caravan numbered about 1,500, by some estimates. Of those, several hundred eventually applied for asylum with hundreds of others, either illegally crossing into the United States or remaining in Mexico. Several migrants said Thursday that De ventet på at resten av campingvognen skulle vises før de satte seg på deres strategi. And for many participants, the size of the caravan, which began in Honduras in mid-October, was a big draw, promising Security from the perils of the migrant trail. The high profile of the caravan also attracted outpouring of humanitarian support along the way, making the migration almost free for its participants, who survived on donated food, water, medical care, used clothing and other services. But in some sectors of Tijuana society, patience with the caravan is already wearing thin. Late Wednesday night, a group of residents in a wealthy beachside neighborhood confronted migrants who spent the night in a park. The residents cursed the migrants, telling them they were not welcome. A contingent of police rushed to the scene and kept the sides apart until the confrontation subsided. Several migrants said they remained awake and vigilant for the rest of the night, worried they would be attacked while they were sleeping.